When you hire M&D Locks and Keys, you get New York City’s most skilled locksmith technicians. We’ll always show you a valid locksmith license and will never show up in anything , but an officially marked M&D service vehicle. Furthermore, our apprentices work alongside our locksmith veterans until they meet the rigorous standards of M&D Locks and Keys. That’s how you know you are getting the best. Besides, if the NYPD, New York City Sheriff and US Marines trust us with their lockout needs, so can you. It’s never fun getting locked out. And it’s hard trusting many New York City locksmith companies these days. So many of them try to over-charge or intentionally break your door or lock just so they can bill you for the repairs. Most of these guys aren’t licensed and don’t know what they’re doing. Always be skeptical if a lock and key tech shows up in an unmarked car and wants to break your lock to get you back in. Make sure you call a true New York locksmith and not a call center who is going to send your request out to the highest bidder. That’s when you tend to get the guys who don’t know what they’re doing and will likely resort to breaking things. You need a locksmith that comes prepared and is ready to show you all his or her credentials. 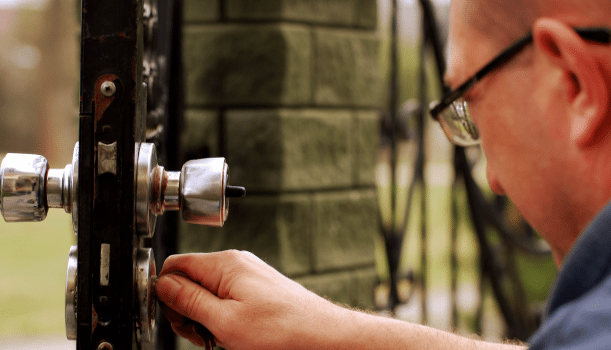 Our training program is extensive because we not only train our locksmiths to master all lockout situations and security camera installations, but we train them on the best routes through the city as well so they can get to you quickly. Once they arrive, then they’ll get you back inside quickly, too. That’s the M&D way. If you have a lockout emergency or are considering installing a new security camera system in your home, give M&D Locks and Keys a call today at 718-484-4050 or simply submit a service request.